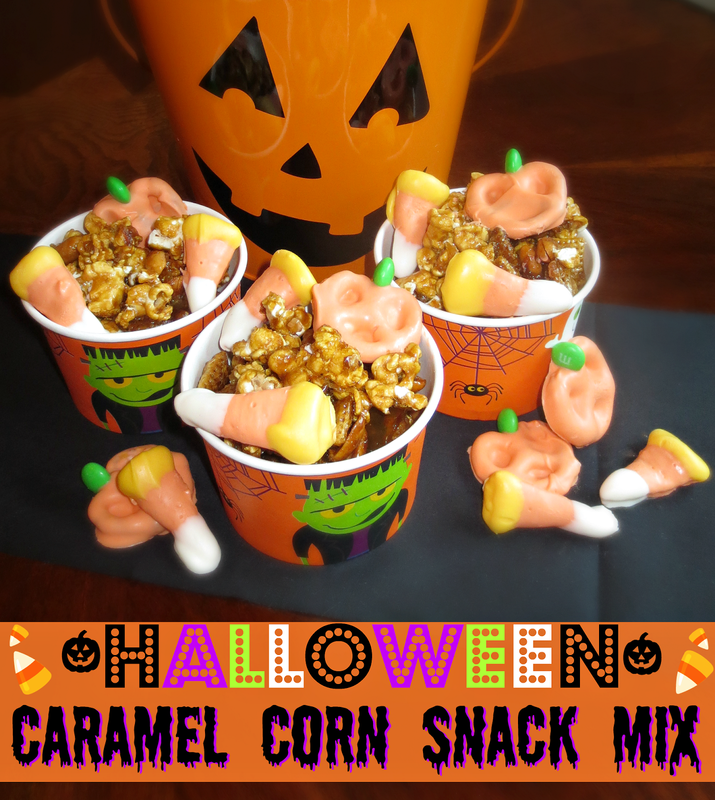 In a large bowl, combine the popcorn, chex and peanuts; set aside. 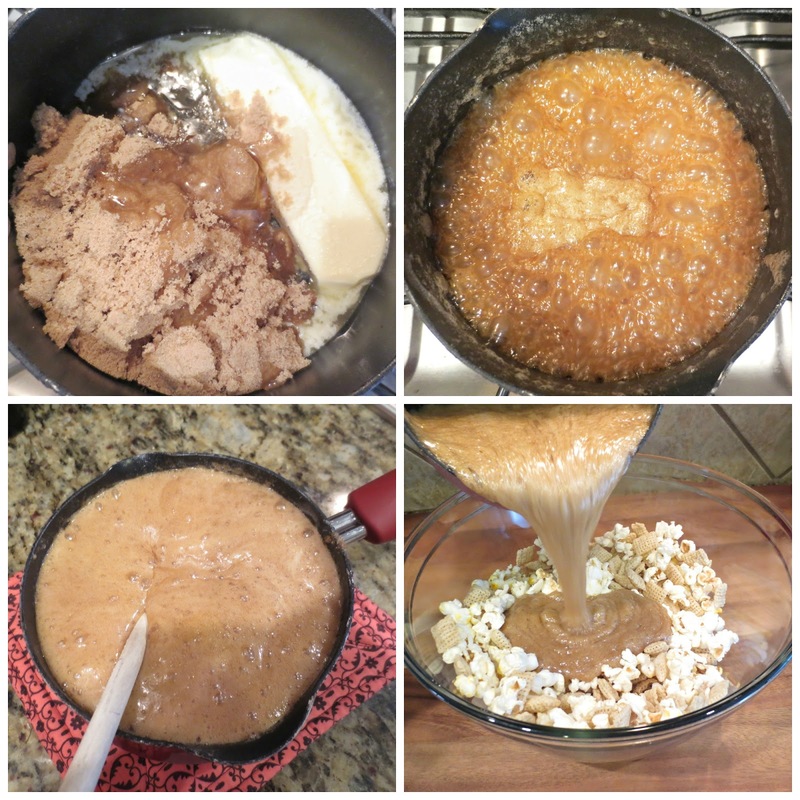 In a small sauce pan add your butter, brown sugar, corn syrup and salt and bring to a boil. Remove from heat and stir in the baking soda and vanilla extract. Pour mixture over the popcorn mix and stir it all together making sure everything is coated evenly. Transfer mixture to a cookie sheet lined with parchment paper (I forgot to do this step, trust me you will want to do it) and spread out evenly. Bake for 30 minutes. Remove from oven and let the mixture cool completely and then break into bit sized pieces. 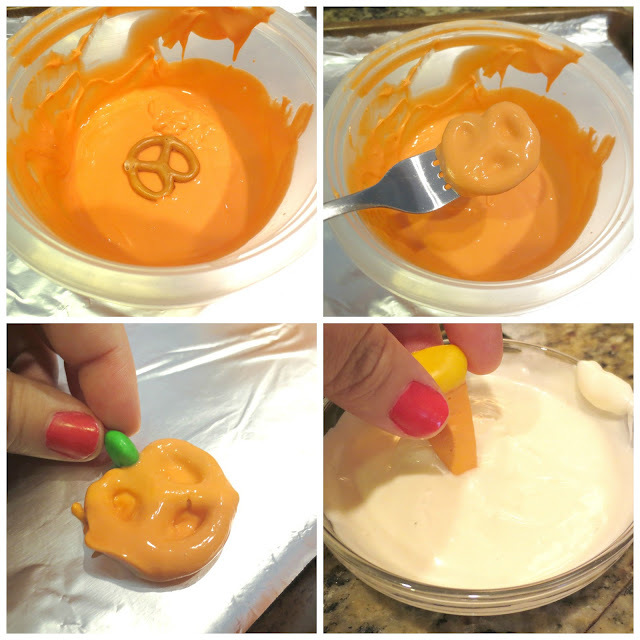 Melt your orange candy melts and drop 1 pretzel at a time into the melted chocolate, turning it over with a fork to completely coat it. Take it out with a fork, making sure to tap off the excess chocolate. Slide it off of the fork onto a parchment paper lined cookie sheet using a spoon and immediately place a green m&m at the top, making sure it sticks into the chocolate. Place in the fridge to set. First melt your orange candy melts and drop 1 bugle at a time into the melted chocolate, turning it over with a fork to completely coat it. Take it out with a fork, making sure to tap off the excess chocolate. Slide it off of the fork onto a parchment paper lined cookie sheet using a spoon. Place in the fridge to set. Melt your yellow candy melts and dip the top end of your orange coated bugle in the melted chocolate and then return to the fridge to set. Repeat the process this time dipping the opposite end in the melted white chocolate. Place in the fridge to set. Mix the chocolate coated pieces into the rest of the snack mix. Store in a air-tight container. My oldest daughter just started her first year of preschool. We made rice krispy treats to take in today for a treat and I can't wait for their Halloween party because I'm definitely going to be making those pumpkin pretzels.